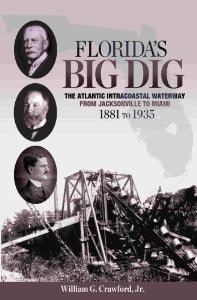 “Florida’s Big Dig” by William G. Crawford, Jr., the story of the Atlantic Intracoastal Waterway. This is my professional website offering my services as a Florida lawyer, author of the award-winning “Florida’s Big Dig,” the story of the federally controlled Atlantic Intracoastal Waterway, and professional historian in resolving legal and historical questions about Florida’s navigable rivers and streams as well as lakes, lagoons, and sounds, including the Atlantic Intracoastal Waterway. Opinions about rivers and streams in other states are not offered. In short, most of the navigable rivers and streams throughout Florida as of the date of statehood, March 3, 1845, became under the supervision, management and control of the federal government. The bottom lands of those same rivers and streams became the property of the new State of Florida to be held in trust for the people of the State of Florida. My services are to be offered exclusively to professionals such as lawyers, engineers, surveyors, and land planners. The scope of my services include the determination of title, easements, sovereign lands, and submerged lands, as well as riparian rights for the installation of docks and other improvements and the rights of upland owners, determinations as to rights of view of land owners blocked by docks and other installations, navigational servitudes, and wherever land touches navigable waters and streams in the State of Florida.